Video footage has emerged showing the hideous response from Senator Fraser Anning’s supporters towards the teenager who egged him. Following the terror attack in New Zealand on Friday (March 15) which left 50 innocent people dead and 50 more wounded, the Australian senator blamed the terrorist’s actions on immigration and the increasing presence of Muslims in the country. One boy who was unwilling to let Anning’s comments slide was 17-year-old Will Connolly, who took decisive action by smashing an egg on the senator’s head at a Conservative National Party Meeting in Melbourne yesterday. Videos of the moment the teenager egged Anning quickly went viral, with several (extremely satisfying) GIFs showing the exact moment the egg hits the senator’s head. However, now another video – taken by Connolly himself – has emerged, showing the moment Anning’s men turned on the 17-year-old and put him in a chokehold. 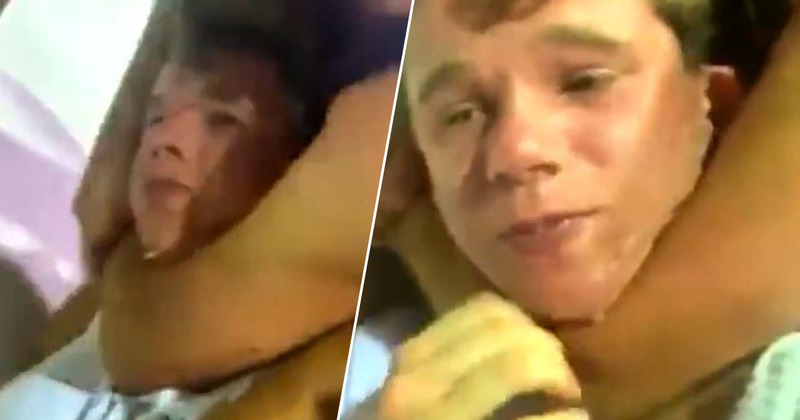 The distressing video shows the teenager being tackled by a group of men – one of which has his arm firmly around the boy’s neck – with Connolly struggling to keep his composure as he’s dragged around. When you take into account that these are grown men surrounding a 17-year-old boy, the appalling moment becomes even more disturbing. And in what world is such a violent act a necessary or appropriate response to someone egging another person? Connolly himself, aka Australia’s newest hero, Egg Boy, was arrested by police, who took his details and then released him without charge, The Telegraph reports. Shortly after the incident, the 17-year-old took to social media to warn others not to follow in his footsteps. New Zealand Prime Minister Jacinda Ardern joined the public condemnation of Anning earlier today (March 17); when asked by a journalist what she thought of the senator’s comments, The Telegraph reports she replied, ‘they’re a disgrace’. The Australian Prime Minister Scott Morrison also sided with the 17-year-old, telling reporters: ‘The full force of the law should be applied to Senator Anning’.